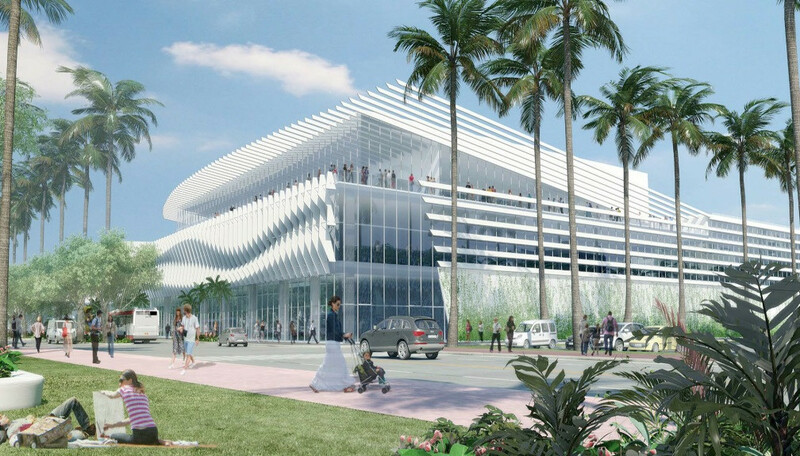 Here it is, publicly revealed for the first time: Arquitectonica and Fentress Architects’ plan for the Miami Beach Convention Center, which is being rushed to begin construction before the end of next year. 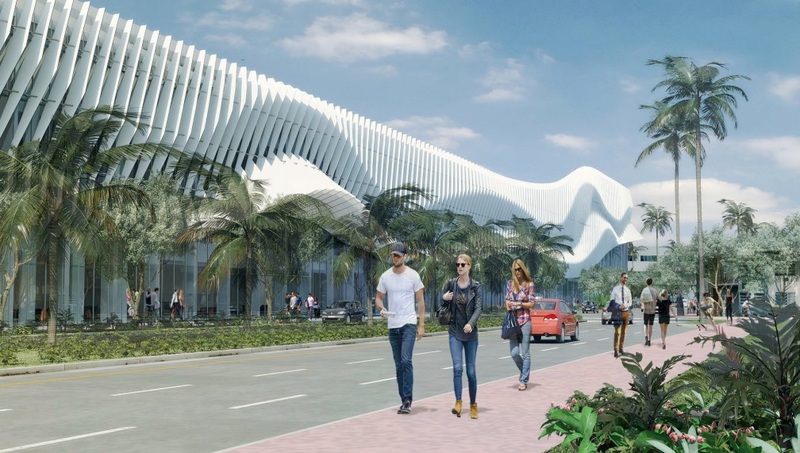 It replaces a previous design by master architect Rem Koolhaas, which was scrapped following the election of Philip Levine as mayor. Koolhaas had won out in a design competition that also included Bjarke Ingels and Zaha Hadid. 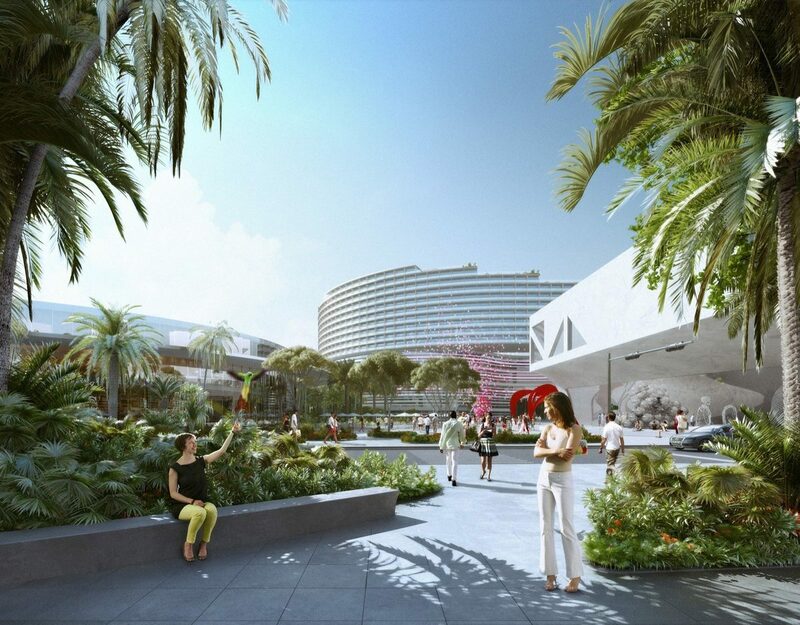 News of Arquitectonica’s selection as exterior architect of the Miami Beach Convention Center was first reported by exMiami in August. 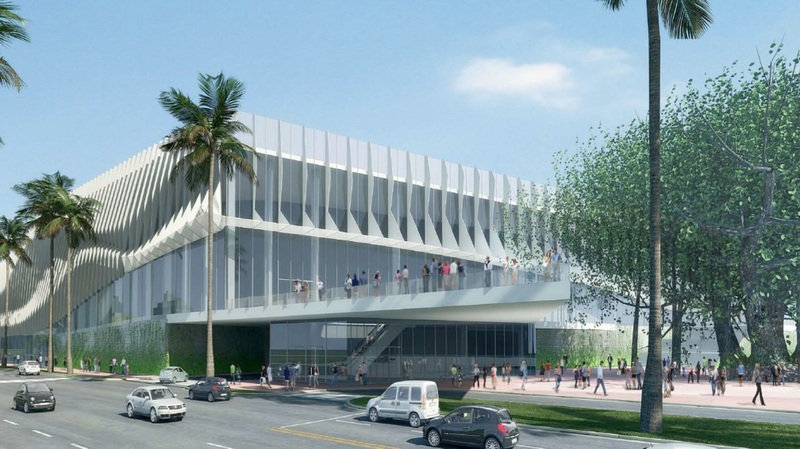 Although Arquitectonica’s design is underwhelming compared to previous proposals, Miami Beach’s officials seem anxious to start work and are unlikely to further delay renovations to the aging center. Landscape design and plans for a park on what is currently a surface parking lot are being handled by Dutch landscape architect West 8, who also designed the Soundscape park in front of the New World Symphony. Do you people just look at the pictures? Arquitectonica was hired just for the exterior ornamentation. Fentress is doing the interiors. I am happy that the Rem Koolhass design was discarded and that the taxpayers of MB are not left with a huge debt for some dubious, neo-Albert Speer white elephant that is only used a few times a year. Arquitectonica’s ornamentation is fresh and when it goes out of fashion, it can be easily resurfaced with something else, unlike the grandiose and very permanent Koolhass confection. Vote that mayor out of office. Both of the designs are limp. And yet both are an improvement over that lego junk they approved back in the 1980s. Everyone seems to be looking at a façade and voting it down. What about the rest of the project? I think the public spaces, the space between buildings and the pavilion are quite successful and this is where the real architecture takes place. On a human scale, does anyone know a convention center that pulls it off and makes you go wow…? I think when you approach this building the fins and waves will seem out of scale and intimidating, so grab solace in the green spaces. The waves could have been above the roof line, more visible from afar and left the ground plane to smaller scale elements. this is an unmitigated disaster. we gave up an absolutely genius design by koolhaas for this garbage from arquitectonica? Extremely underwhelming. All this work and we’re still left with a 500,000 SF space? After looking again. It’s worst than meh, it’s bad. The 3rd rendering shows how terrible the facade is. First Arquitectonica makes towers with herpes, now they put squiggly line on a building. Too bad, they used to do good work. But it’s bad. I just vomited in my mouth a little. Arquitectonica running out of design ideas. They need to hire new, more creative arquitects/designers. Bring back the Koolhaas design. 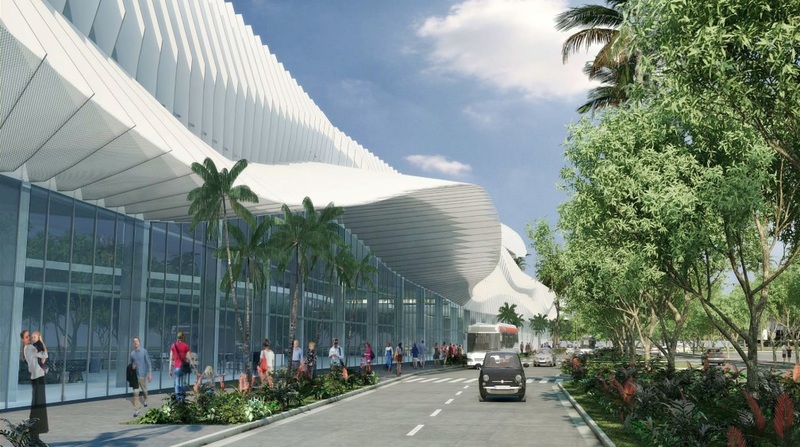 It will do wonders for the convention center and Miami Beach. wow, ugly, as everything that arquitectonica do!!!! 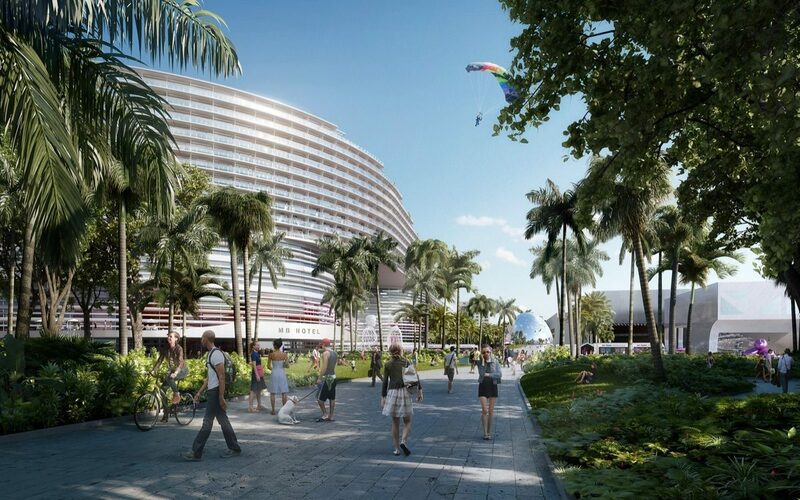 Please bring back the Koolhaas design and impeach Levine while we’re at it! Looks like 1970s airport terminal. Then again, I don’t even go to the Beach anymore. 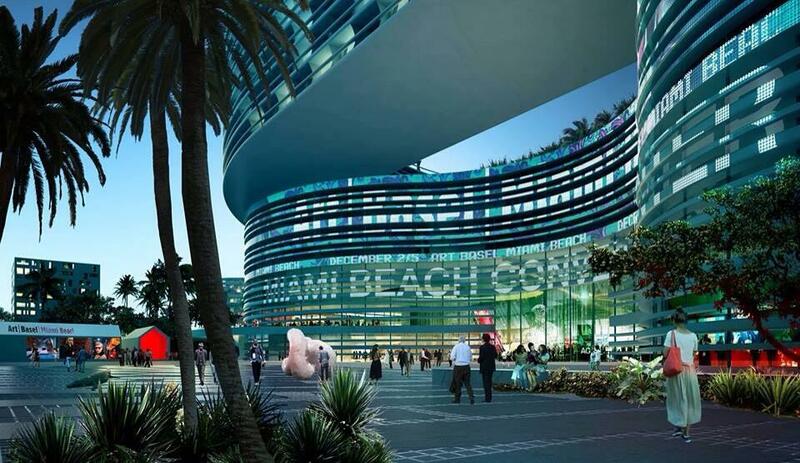 Once City Centre, World Center and Design District are done, I’ll probably forget about Miami Beach altogether. On the same boat. I rarely if ever go to the beach anymore. The Fillmore a couple times a year maybe. Arquitectonica’s designs are always a veneer, seldom are they about the totality of a building, as good architecture should be. This is so sophomoric, quite trivial! It’s all about going cheap. MB needs to start over. Hire Bohlin Cywinski Jackson firm. Their product is outstanding. ayyy que feo, honestly is awful. This would be considered mediocre in Kendall. Arquitectonica is great at designing blah condos; we should hold our public spaces to a higher design standard. Beyond the superficial “I don’t like the design” complaints I have, I have serious concerns that when officials constantly pull the rug from under reputable architects, that it will discourage them from submitting design proposals for future projects. What incentive do Koolhaas, Ingels, or Hadid have when they believe they’ll just be steamrolled by corruption (okay, I’m making a wild guess on that, but I’m certain something fishy is going on). The city could not afford Koolhass grandiose, expensive and dysfunctional design and instead went with Fentress, the leader in convention center design. Arquitectonica was hired just to do the ornamentation and had to stay within budget. The taxpayers won and the people who just want to be entertained by celebrarchitects lost. I agree that Koolhaas’ “Fontainebleau on steroids” monstrocity had to go. But this “lipstick on a pig” approach is wrong as well, since the outcome will be predictably atrocious. Thought even the previous (original) design from Arquitectonica was more imaginative. Maybe West 8 will bring it with the green space. I am surprised that the city would spend this much money for a structure that sits at the same elevation unless of course they plan to have live marine interactive art on the first floor. Now that would be cool! I’m confused as to why y’all believe Miami even needs a convention center. It fails at understanding Miami/Miami Beach. We are getting drenched with rain almost daily and all the drop off spaces in the photos show light coming through the fins and no lateral covers for guests as they arrive. This structure should be a thing of beauty but it NEEDS to function as well. Not to mention that these fins will be a nightmare to maintain in the future as pressure washing and re-painting will be daunting. These buildings don’t just need to be beautiful but functional for the people who will use it. An Architect needs to know the purpose AND the setting of a building but obviously Arquitectonica and staff never plan on actually attending events here so they don’t care.